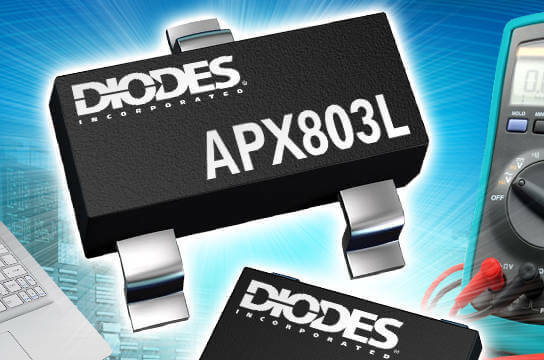 Diodes Incorporated (Nasdaq: DIOD), a leading global manufacturer and supplier of high-quality application specific standard products within the broad discrete, logic, analog and mixed-signal semiconductor markets, today introduced the APX803L. This micro-power voltage detector is designed to support the supervisory circuits of microprocessors and microcontrollers by enabling accurate monitoring of voltage levels and will generate a reset signal whenever a supply rail falls below a defined threshold. This function is required by many systems such as computers, communications equipment, and portable battery-powered devices. The APX803L’s low quiescent current also makes it very attractive when appliances like televisions are operating in standby mode. Offered in a detection voltage level range of 1.2V to 5.0V in 0.1V steps, the APX803L provides a threshold accuracy of ±1.5%, while consuming just 1μA and requiring no external components. Whenever the monitored VCC power supply rail drops below the chosen threshold, the APX803L asserts a reset signal within 20μs that is held until the supply rail recovers to a level above the threshold. The device’s reset pin provides an open-drain, active-low output with device ordering options that allow for delay times of 0ms, 55ms, 220ms, or 450ms. The APX803L is available in 3-pin SOT23, SOT323, and SC59 packages, as well as a 5-pin SOT25 package, and supports drop-in replacements and original designs. Further information is available at www.diodes.com.